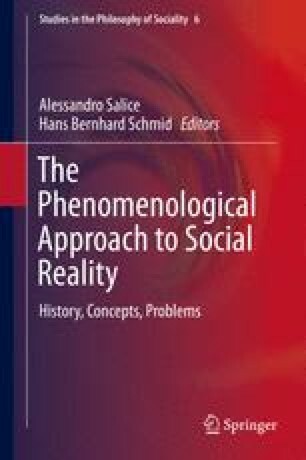 The chapter explores the topic of experiential sharing by drawing on the early contributions of the phenomenologists Alfred Schutz and Gerda Walther. It is argued that both Schutz and Walther support, from complementary perspectives, an approach to experiential sharing that has tended to be overlooked in current debates. This approach highlights specific experiential interrelations taking place among individuals who are jointly engaged and located in a common environment, and situates this type of sharing within a broader and richer spectrum of sharing phenomena. Whereas Schutz’ route to the sharing of experiences describes the latter as a pre-reflective interlocking of individual streams of experiences, arising from a reciprocal Thou-orientation, Walther provides a textured account of different types of sharing and correlated forms of communities. Schweikard, D. and Schmid, H.-B. 2013. Collective intentionality. In The Stanford encyclopedia of philosophy, ed. E. Zalta (Summer 2013 Edition). http://plato.stanford.edu/archives/sum2013/entries/collective-intentionality/. Accessed 14 Oct 2014. Tollefsen, D. 2004. Collective intentionality. In Internet encyclopedia of philosophy, ed. J. Fieser and B. Dowden. http://www.iep.utm.edu/coll-int/. Accessed 14 Oct 2014.